Preservationists are trying to save the building on the left in the photo at 1968 N. Milwaukee ave as a developer seeks to build a 150-unit condo building. LOGAN SQUARE — A neighborhood group is seeking to protect a 99-year-old building from demolition as part of a 150-unit condominium project in Logan Square. Although the building at 1968-70 N. Milwaukee Ave. is not landmarked, preservationists said it is worth saving for a number of reasons including that it was designed by the architect John Ahlshlager. Ahlshalger designed several local landmarked buildings including the Logan Theatre and Schulze Bakery in Washington Park. The petition to save the Weyland Building, which was started by Logan Square Preservation, had gained nearly 500 signatures online as of Monday night. The storefronts of the three-story, mixed-use building are currently vacant. "Milwaukee Avenue is a real historic thoroughfare for this city and a lot of the early 20th century-built environment has been lost of the years, especially in the area between Western and California," said Andrew Schneider, president of Logan Square Preservation. "We think it's a real worthwhile opportunity to preserve a part of that streetscape." 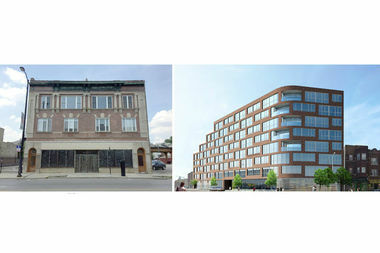 The developer, Clayco, filed a zoning change application in July to construct an eight-story building on the southwest corner of the intersection of Armitage and Milwaukee avenues. Logan Square Preservation is asking the developer to consider incorporating the building into the new development to prevent its total demolition. Alan Schachtman, director and residential business leader at Clayco, said the developer is working with community groups to discuss possible modifications to the plan involving preservation of the building. "We are working with the alderman and the community group to come to a project that is acceptable to them," Schachtman said. Schachtman declined to discuss specifics of the preservation proposals or when the project would start to move forward. "I hope to get to an overall neighborhood meeting in the near future, but that’s really in the hands of the alderman and the community group to decide," he said. Schachtman said the project, once the final plans are decided upon, will take between up to 1 year and 4 months to complete.